DO YOU OFFER FREE WIFI? Yes! All of our shops offer free wifi to our customers! HOW DO I GET A FREE BIRTHDAY CUPCAKE! We love celebrating birthdays and especially yours! Sign-up for our email list and you’ll receive a free cupcake coupon via email to redeem any time during your birthday month. Make sure to sign-up at least one month before your birthday. Remember, if you opt out of our emails, you won’t receive your free birthday cupcake coupon. HOW BIG ARE YOUR CUPCAKES? Our standard size cupcakes are larger than those you would make at home but smaller than a jumbo-sized cupcake (we think they’re just about the perfect size!). 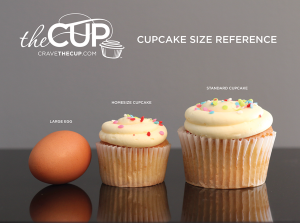 Our homesize cupcakes are the size you would make at home. Daily homesize flavors included confetti, tuxedo, red velvet and strawberries ‘n’ cream. We also offer other homesize cupcake flavors for orders of 200 or more. Please call your local shop for more details. HOW MUCH NOTICE DO I NEED TO GIVE YOU? Feel free to walk in and purchase up to 36 cupcakes of your choice. For orders over three dozen, please provide at least 48 hours notice (or more if you can!) and we will have your order ready when you arrive. HOW SHOULD I STORE MY CUPCAKES? We do not recommend refrigerating cupcakes or cookies. As with all baked products, our cupcakes are best when consumed the day of purchase. Cupcakes that will be served within 24 hours of pick-up should be stored in their box at room temperature. Our cookies, however, should be frozen if they will not be served within 12 hours of pick-up. All of our sweet treats can be frozen for up to five days. Simply remove them from the freezer 3 – 6 hours before serving to allow them to return to room temperature. DO YOU DELIVER? The Cup offers delivery to most of the St. Louis city and county zip codes with a 24-hr. notice. Click here to learn more about our delivery service. DO YOU SHIP YOUR PRODUCTS? We can’t currently ship, but join our mailing list and you’ll know if we ever figure it out. CAN I FROST MY OWN CUPCAKE? Of course! Unfrosted cupcakes are available in any of the current day’s flavors. In addition, you can purchase a “buttercup” (a 1 oz. portion) or a pint any of our delicious made-from-scratch buttercreams available that day. CAN I RENT/PURCHASE A STAND FOR MY CUPCAKES? Yes. We have a limited number of towers for rent and we also have a disposable stand available for purchase that holds 24 Cup cupcakes. Please contact your local store for pricing and availability information. DOES THE CUP OFFER CUSTOM DECORATING? While The Cup does not offer custom piping, we can have a custom stamp created for you to complement your event. (Please note: custom stamps cannot be made of copyrighted characters due to trademarking laws). Custom stamps cost $25 and require a two week lead time. Please contact your local store to discuss options with one of our managers. We also have a selection of colored candy discs and colored sprinkles that can be added to any cupcake. We would be happy to substitute the “normal” toppings for two colors of discs or sprinkles per dozen. For an additional charge, fondant conversation discs (happy birthday, congrats!, thanks!, i love you, xoxo, happy anniversary, just because, thinking of you, have a great day) may be available at your local store. If you live in the St. Louis area and are looking for additional custom designs, you can contact our sister store, The Cakery. IF I PRE-ORDER CAN I CHOOSE FROM ANY OF YOUR FLAVORS? You are welcome to order any combination of the flavors offered the week your order is filled. Featured, seasonal, and limited edition flavors not offered on the day your order is filled are, unfortunately, not available in small quantities. We are happy to make exceptions for orders over five dozen (60 cupcakes) of one flavor. Please contact your local shop to discuss the details of your large order with one of our managers. WHAT ARE THE TERMS OF THE DOZEN DOZENS CARD? Buy a Dozen Dozens and Get a Dozen Free! One punch for every dozen cupcakes purchased at one time. Card may not be combined with any other discounts or offers including gift card purchase or redemption. Free dozen must be redeemed during a single visit. WHY DID YOU CHANGE YOUR NAME? When we opened our first store in 2007, we were one of several bakeries nationwide with “Cupcakery” in their name or as their name. We had no idea at the time that our customers would be so wonderful and loyal and that their demand for our product would prompt us to open more shops. As we expanded into new cities and states, we recognized the need to differentiate ourselves from those other, similarly named bakeries. We made the switch from The Cupcakery to The Cup in July 2010. We are the same great people, we serve the same delicious cupcakes, we just have a shorter name and a swirlier logo. I HAVE A FOOD ALLERGY. WHAT’S IN YOUR CUPCAKES? You mean besides love?!? – All of our baked products contain: wheat, soy, dairy, sugar, eggs and nuts. Our products are made on equipment shared with peanuts, tree nuts and coconut. A large selection of our from-scratch buttercreams are made of gluten-free ingredients. Limited quantities of gluten-free cupcakes available, please call ahead to check availability. Our bakery is NOT gluten-free, so the potential for cross-contamination exists. ARE YOUR PRODUCTS NUT FREE? The Cup is not a nut-free bakery. One of our daily cupcake flavors includes peanuts and various other nuts are in special cupcakes throughout the year. In addition, most of our buttercreams contain pure almond extract. We recommend that individuals with severe nut allergies forgo our products. Our sister bakery The Cakery is a nut free bakery. Click here to see our gluten-free cupcake options. DO YOU HAVE ANY VEGAN OPTIONS? Yes! Click here to learn more. I WOULD LIKE TO WORK AT THE CUP. WHO SHOULD I CONTACT? We think we have a pretty good thing going and we’d love an opportunity to meet you. While staffing needs vary from store to store, our General Managers would be happy to receive your application regarding your interest. Please complete this APPLICATION FORM. DO YOU MAKE DONATIONS TO CHARITY EVENTS? Yes. We regularly support several local and national non-profit organizations. If you would like to submit a donation request, please complete this DONATION FORM at least 4 weeks before your event. If your organization is selected, you will receive a confirmation by email. CAN I PURCHASE CUPCAKES AT A DISCOUNT FOR MY NONPROFIT EVENT OR BAKE SALE? If you would like to purchase cupcakes at our nonprofit discounted rate (20% off), please email your local Cup location with the details of your request and/or event one month in advance. If you are approved for a discounted order, you can order up to 10 dozen cupcakes to be picked up on a Wednesday or Thursday from The Cup. You may choose an assortment of Tuxedo, Confetti or Double Chocolate cupcakes, or you may choose for all of your cupcakes to be ONE other flavor with regular buttercream frosting. To receive our nonprofit discount, you must be a 501(c)3 nonprofit organization. Please bring your State Tax Exempt form in when you pay for and pick up your order in order to be exempt from tax. I DIDN’T RECEIVE AN EMAIL CONFIRMATION. Please make sure to check your spam folder for email confirmations. If you have any questions or concerns regarding your online order, please call the shop you selected for pick-up.